GameCell will be releasing their new game “Celestial Defense” on March 14th on the app store and the android market. 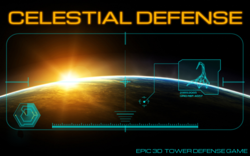 Celestial Defense is a skillfully designed 3D tower defense game that takes place in the year 2185. Your mission will be to defend your space colony against an alien invasion that has figured out a way to teleport using your own portals. There are over 30 defense towers to guard your base. You will be given five defense towers and one power generator after the first few training missions. You can buy new defense towers using precious elements you collect while playing the game (Not InApps!). Strategize and build towers in carefully selected locations within your colony to defend your main silo. Stop the aliens from attacking your main generator and stealing its’ power. Game will be available to download from both App Store and the Android Market on the 13th of March . Celestial Defense is only $0.99 during the first week of release (75% off!). After the first week, it will be $3.99 to purchase. Celestial Defense supports iPad, iPad 2, iPhone 3GS, iPhone 4, iPhone 4S, iPod Touch 4th Generation, iPod Touch 3rd generation 16gb and higher. GameCell is a mobile games development company based in the UK. They are currently working on other exciting new games for the app store and the android market. For further information, please contact, Charith N - c@gamecell.com .